E3 Canine (Powder) is 100% guaranteed. enhanced energy, vitality and endurance – great for older dogs! suggested use: One or more times daily as desired. As with all dietary changes, please introduce new foods slowly to avoid digestive upsets. In some cases, doubling the maximum feeding over a short period of time may prove beneficial. 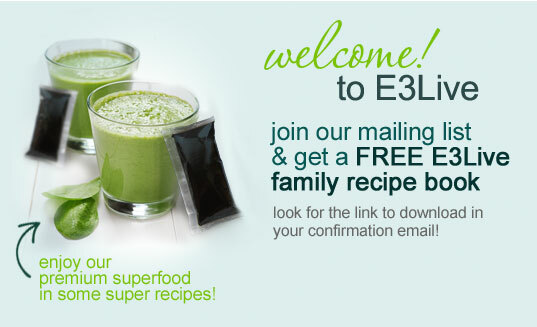 Note: Included scoop measures 1/2 Teaspoon, about 1 gram of E3 Canine Powder. Optimal nutrition is a key element in the health of your dog and may encourage shiny lustrous coat, healthy skin, strengthened immune system and more. Unfortunately, our dogs may not get these important nutrients from the foods we feed them. Even the best diets may not provide your dog the pure high quality nutrition found in E3 Canine. E3 Canine is 100% Certified Organic AFA (Aphanizomenon flos-aquae), a wild harvested Nutrient Dense AquaBotanical. By adding E3 Canine to your dog’s daily feed, your dog may receive gram for gram one of the highest protein and trace mineral concentrations of any natural food. E3 Canine is easily absorbed and supports coat, joints, brain function and general health by providing the vitamins, minerals, amino acids and essential fatty acids that your dog needs. No additives, no pesticides and no preservatives. 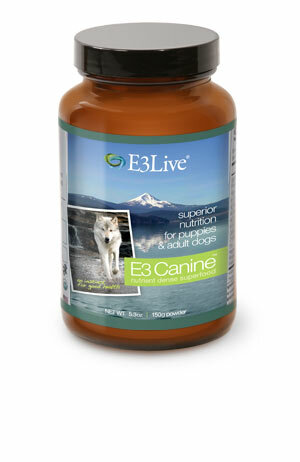 E3 Canine (Powder) has over 65 vitamins, minerals, amino acids and essential fatty acids. We also offer E3 Canine in a liquid form (16 oz). We deliver our liquid form AFA fresh-frozen to ensure quality and freshness. How to make E3 Canine Ice Cube Treats! Orso the Superdog Loves E3 Canine! I bought this for my 10 1/2 year old Pomeranian. She's gotten a lot slower over the last couple years. Since she's been taking this her energy has increased and so has her activity level. She jumps up onto the recliner without having to stretch first! She can even jump up on my bed again without help. I am SO glad to see my baby feeling better! She likes the taste too. I just sprinkle it over her food every morning and she eats it right up. My dog is one active, alert, and loving pug. He has yet to have any medical issues. Never has had an ear infection, teeth issues, skin issues...nothing! And he's always been on E3...a scoop a day keeps the vet away! And when he goes in for checkups, the vet is amazed that his degenerative hip issue is non-existent!